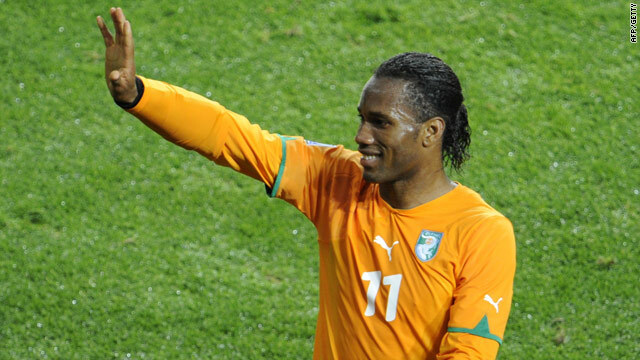 Drogba played against Portugal wearing a special protective cast on his fractured arm. (CNN) -- Ivory Coast coach Sven-Goran Eriksson is set to play his injured captain Didier Drogba from the start of their crucial World Cup Group G clash against Brazil on Sunday. Drogba fractured his arm during a pre-World Cup warm-up match against Japan but still managed 25 minutes during Ivory Coast's 0-0 draw against Portugal in their opener on Tuesday. The Chelsea star wore a cast to protect his injury and came close to making the breakthrough after coming off the bench. Former England boss Eriksson was clearly satisfied with what he saw and his performances in training. "It wouldn't be surprising if Drogba plays from the start against Brazil. He came on for 25 minutes against Portugal and it went well," Eriksson told AFP. Brazil opened their campaign with a 2-1 win over North Korea but face stiffer tests against the Ivorians and Portugal in the so-called "Group of Death." Drogba's goals powered Chelsea to the English league and FA Cup double and is clearly vital to the Ivory Coast cause despite still recovering from the surgery to his arm on June 5. Portugal coach Carlos Queiroz was unhappy that Drogba had been allowed to play, suggesting he was receiving special treatment for world governing body FIFA. Meanwhile, Fabio Capello, coach of Eriksson's former charges, said he would not change his policy of not revealing his team to his squad until two hours before kick off. "Always (on) the day of the game, not the day before," he replied to reporters who wanted to know if he was standing by goalkeeper Robert Green, whose astonishing blunder gifted the USA their equaliser in their Group C opener. Capello would also not be drawn on rumors that striker Emile Heskey would be replaced for Friday's crucial game against Algeria in Cape Town.